We manufacture and supply high performance polyamide thermally broken commercial doors and entrances. 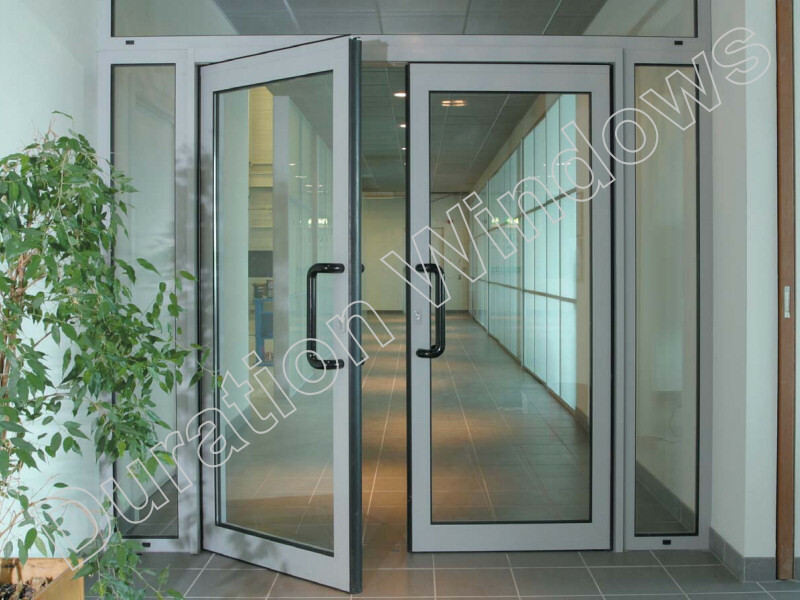 They are high security aluminium swing doors that can be up to 2.5 metres tall, with out the need for top lights. They all have anti-finger trap sections and low thresholds, with an enhanced drainage system. Our commercial doors can be manufactured for manual or automatic opening (Please note: gearing, motors and automatic sensors are not supplied). White as standard, but are available silver anodised or in over 200 different RAL colours, that can be provided to individual taste or to suit corporate or brand requirements. Single or double doors up to 2.5 metres tall. Can open in or out, or both if you wish. Can be manufactured for manual or automatic opening (Gearing etc. not supplied). Anti-finger trap sections, pivot swing door (no hinges). Double ramped low threshold complies with part M.
High security six lever hook locks as standard. Polyamide thermally broken profiles. Complies with Doc. L for thermal transmittance, with U-values as low as 1.7 W/M²K (triple glazed). Suitable for high traffic light to heavy commercial applications, ideal for shops, schools and other educational buildings. Triple glazing is required to achieve lowest possible U value. We do not supply triple glazing for our Commercial Systems.